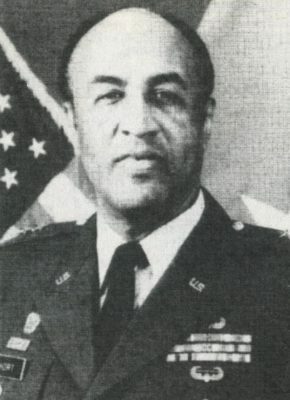 Lieutenant General Alonzo Earl Short, Jr. was at one point one of the highest-ranking African American officers on active duty in the Untied States Army. Short’s responsibilities during his service included managing the communications systems between the White House and various military branches. Short was born in Greenville, North Carolina although the precise date is unknown. He attended Virginia State College (VSU) in Petersburg, Virginia from 1958 to 1962 and graduated with a Bachelor of Science in Education. In 1962, Alonzo entered the U.S. Army as a commissioned officer (Second Lieutenant) after completing the Reserve Officer Training Program (ROTC) at Virginia State University. On November 28, 1963, Alonzo was promoted to First Lieutenant, serving as a Platoon Leader and Staff Officer at Fort Riley, Kansas. He next held a variety of posts in the Army Signal Corps. As years passed, he rapidly continued climbing the ranks. On October 8, 1965 he was promoted to Captain and on November 27, 1966 he was promoted to Major. He served the first of two tours in Vietnamfrom 1967 as a Staff Planning and Engineering Officer and he served again from 1972 to 1973 as Deputy G-6 Adviser with the First Regional Assistance Command. Through the rest of the 1970s Short served at Fort Monmouth, New Jersey and Fort Campbell, Kentucky. On August 1, 1981 Short was promoted to Colonel. Through that decade he held Signal Corps related assignments at Fort Huachuca, Arizona, Fort Hood, Texas, Fort Ritchie, Maryland, and Fort Belvoir, Virginia. On June 1, 1986, he was promoted to Brigadier General. On May 25, 1990 Short was promoted from Major General to Lieutenant General, becoming the highest ranking African American on active duty at the time. In addition to achieving Lieutenant General rank, Short received numerous awards and recognitions for his service on multiple tours including the Distinguished Service Medal and the Legion of Merit. Between his tours, Short attended various colleges and obtained several degrees. In May 1973, following the end of his second tour in Vietnam, Alonzo attended the Armed Forces Staff College in Norfolk, Virginia. Graduating on January 1974, he continued working at the College as an Academic Plans Officer. Continuing his education, Short took classes in systems engineering at Fort Monmouth, New Jersey. In 1975, Short attended the New York Institute of Technology in Old Westbury, New York where he received a master’s degree in Business Management. General Short retired from the military in 1992, marking over thirty years of exceptional service. From 1991 to 1994, Short worked as the Director of the Defense Information Systems Agency (DISA). DISA is a Combat Support Agency that assists and provides command and control while additionally ensuring information sharing uptime and providing an infrastructure to provide direct support. Short then became served as President and Chief Executive Officer (CEO) of MICAH Systems, an information and technologies management consulting firm, from 1994 to 1997. In March, 2001, Alonzo became the President and Chief Operating Officer of Houston Associates Inc., a company primarily focused on constructing mission-critical networks and control infrastructure applications. Houston Associates was acquired by Raytheon Company in 2006. Walter L. Hawkins, Black American Military Leaders: a Biographical Dictionary, Jefferson: North Carolina: McFarland and Company, 2009); Jimmie Jones, Shock and Awe: an Introduction to African American Army Generals 1968-1992(Pittsburgh: Dorrance Publishing Company, 2015); Lt. General (R) Alonzo E. Short, Jr.. Virginia State University Alumni Association, http://www.vsuaaonline.com/joomla-pages/113-alumni-in-the-military/463-lt-general-alonzo-short.